One of the great challenges of pin loom weaving is that while the looms last virtually forever, they are useless without the right needle. Happily, I am here to report that there are an increasing number of good needles available to you. Keep in mind that a 4" pin loom works best with a 6" rounded tip needle. 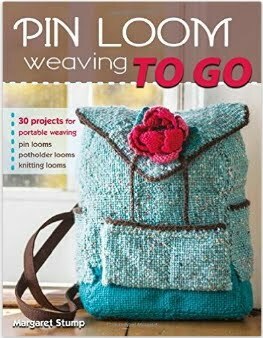 The 2" pin loom needs a needle that is about 4" long with a rounded tip. Here is a list from my exploration of needle resources. I doubt that its complete, I hope that you will consider adding on any information you have discovered about needle availability. 1) Replacement needles from Schacht Spindle Co., makers of the Zoom Loom. Many Zoom Loom sellers will likely have 6" weaving needles in stock or be able to get them for you. 2) 6" Trapunto needle. Trapunto is a style of quilting/fiber work that calls for a long needle with a blunt tip. This needle appears to be exactly the same dimensions as a pin loom weaving needle. When I did a search online I found the Havel's Sewing website, which offers both trapunto needles and my next suggestion. There appear to be a number of online sources for trapunto needles. 3) Ribbon Weaving Needles. This is a set of three needles, 4", 6" and 8". I bought this set locally but they are also available from Havel's. (I do not have any kind of relationship with this business.) These needles are also available from a variety of online sources. These needles have a rectangular cross section, they are very strong and have a blunt, rounded tip. Their dimensions are 1/8" wide and 1/16" thick and they do easily fit through the pins when held on their side. The 4" needle works beautifully with a 2" loom. Because they are stronger than a normal pin loom, I am tempted to use them when I am working with a person new to weaving who, I fear, might bend my weaving needle. This set also offers an 8" needle which is very handy if you have a 6" pin loom or any larger loom. I have had a few weavers note that they like to use a larger needle on the 4" loom because it is easier to handle and hold on to. 4) I found all of the following needles in local big box craft stores. The dimensions are correct for weaving on pin looms but all come with sharp tips, which means that you do need to round off the tip using a file or whetstone. This set of three decorator needles includes one 6" needle with a pointed tip. I find the other needles too thin to be of much use. 5) This set of four upholstery needles come in 6", 8", 10" and 12" lengths. The two largest seem too unwieldy to be helpful. The 6" needle works perfectly on a 4" pin loom, once you round off the point. I normally use this 8" needle on my 6" pin loom. 6) This last entry is for the 2" pin loom. This is a package marked Doll Needles found in the notions department. It contains five needles, but the only one that interests me is the one large 3 3/4" needle that works perfectly with the smallest pin loom. There have been several occasions where all of the notions, including these needles, have been on sale for 50% off. Since I am teaching classes with these looms, I often swoop in and pick up a bunch of packages. When I started using these looms a number of years ago, there really was a sense of looking for a needle in a haystack. Now I am happy to report that we have finally have haystacks full of needles-- perfect for pin loom weaving! Hello everybody! I hope you had a great summer! I have not posted anything for months due to getting caught up in the process of designing new patterns and writing about them for a second book on pin loom weaving. The book should be out in another nine months or so. Yes, it takes longer to make a book than to make a baby and sometimes it feels like its a lot more trouble. After weaving and writing for months, I feel as though I just landed from a very long trip, a little dizzy and very happy to be back. So, here is an idea that came out of the fact that thrift stores often have an enormous selection of embroidery hoops. It just seems like there should be a lot of ways to use all those cast off embroidery hoops. This is one way, a pin loom carousel. Its intended as a mobile for a baby with the soft animals tied on with ribbon. The hoop was painted a light sky blue. It would look lovely with clouds painted on it or script written around it. It would be possible to get much fancier with your design by getting a used baby's mobile that has a turner and music built in. Just hang the hoop on that mechanism and it will parade in a circle. My choice was to use sheep, lambs and one dog. The sheep and dog are patterns that come from the Pin Loom Weaving book. 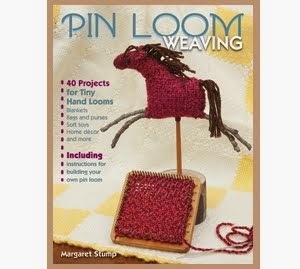 But it would look great with any of the pin loom animals. Plus, when baby gets older, the toys can come down to be played with. * This could make a fun and thoughtful baby gift or, if you have less time, perhaps just one sheep as part of a gift decoration. *Keep in mind that there are chenille sticks in the design of each of these animals, so baby will need to be quite a bit older or the chenille sticks will need to be removed. Here is a way to remove danger for a baby. With the dog, just leave the chenille sticks out of the legs. With the sheep and lambs, you will need to crochet replacement legs. I would suggest making a chain in the length and color to match the original leg, then half-double crochet back up the length. Attach to the body. You will have made a floppy but workable leg.